Yes, it is a 2-Button awesomeness! At first look you might say 'What? only two buttons?'. Well, when something is good it does not need more than the necessary. 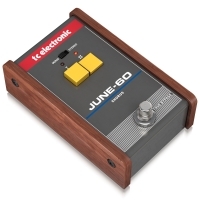 The TC Electronic June-60 is a great reproduction of the legendary chorus circuit found in Roland Juno-60 synths. This chorus sound is so iconic you can hear it, probably without knowing it is it, in so many hits from the '80s. 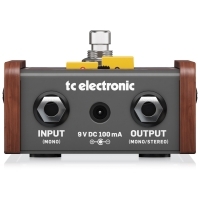 The June-60 can run stereo or mono, equipped with a true bypass switch and built with style yet still durable enough for the stage. Use the I and II buttons to select the chorus speed that fits best to what you play, or combine both. That is it, you are all set. 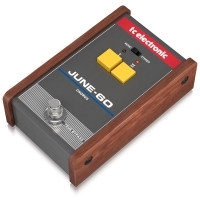 The TC Electronic June-60 is as simple as that!